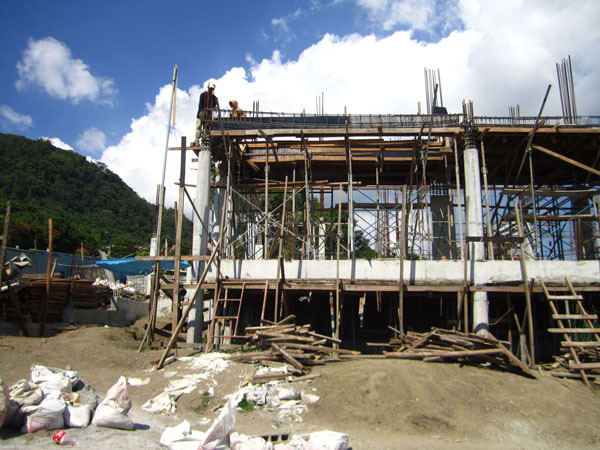 The construction of a house takes time and effort. 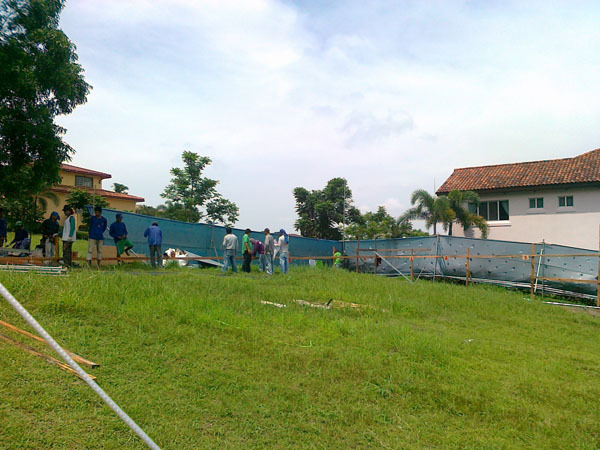 We try to document the activities on site for the appreciation and file of the client. 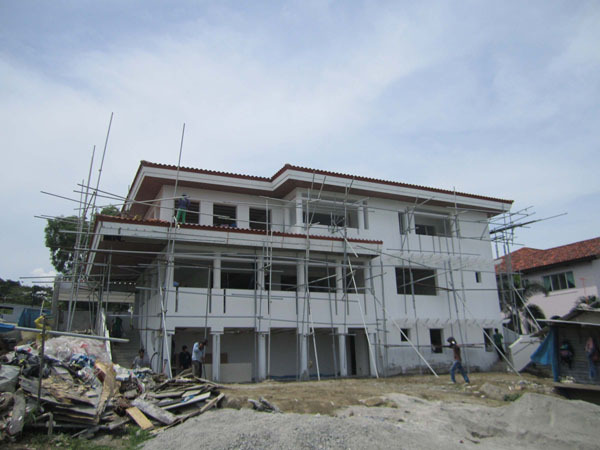 Following are chosen pictures of a house in construction. A professor once told a class, it doesnt matter if you’re afraid of heights, when you need to, you will have to check your roof. 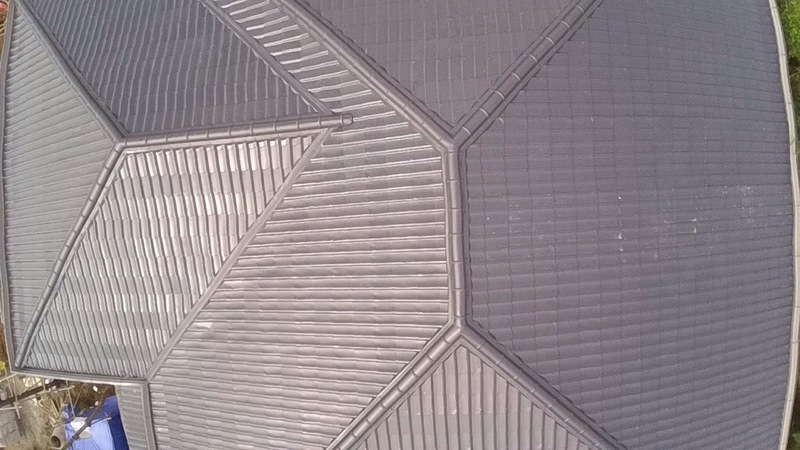 Years later this writer considers these words, as one negotiates a roof during inspection. Most times you just try not to fall, and not damage anything on the way down. 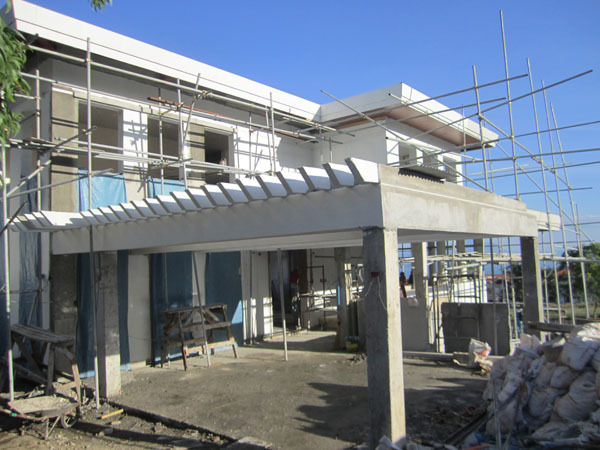 One of the first things is done on the ground, close to the safety of terra firma when the roof materials are delivered. 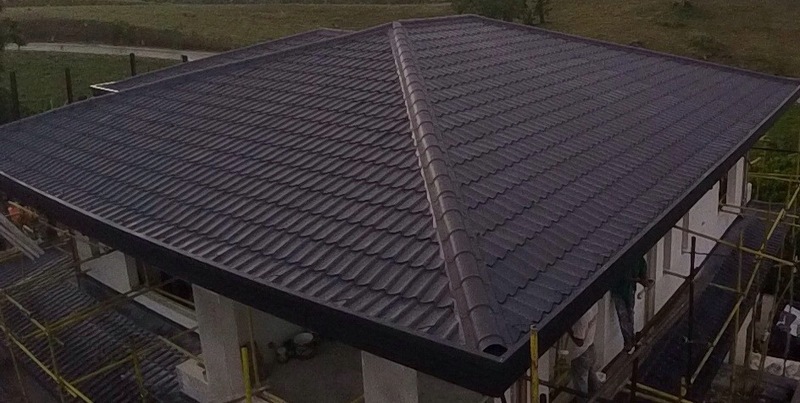 We check between the thickness specified and the thickness of the roof material that arrived, check the bended materials like: gutters, fascias, end flashings, and that everything is in the correct color. It’s usually good to leave the approved sample on site to compare to when needed. Upon installation and you’re up there against your better judgement, see if all the tekscrews or whatever methodology for fastening was executed properly. If there is an agreed coloring or retouching this should be applied prior to final acceptance. 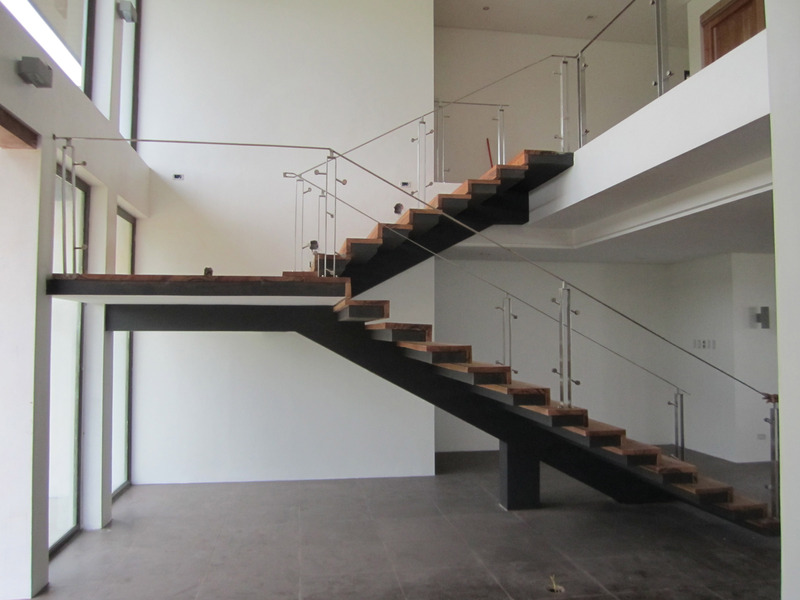 The over all shape and form should generally be as shown on plan or as seen in the agreed shop drawings that the supplier and installers sent to the client and architect. 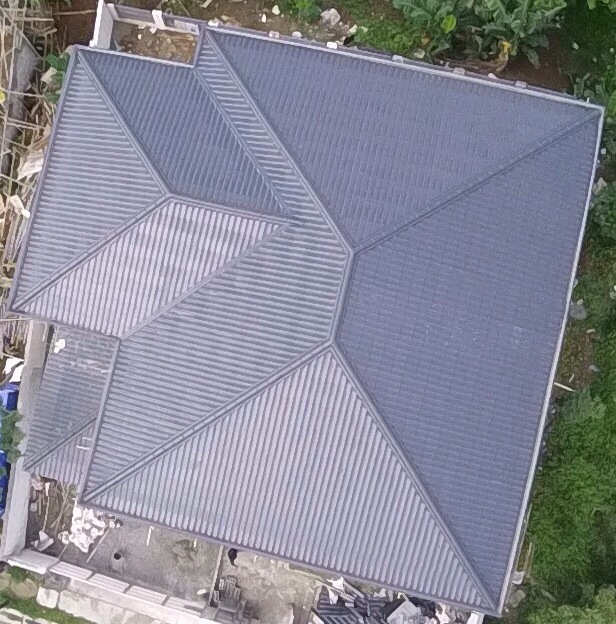 All the lines that are level specially along the roof edges should be straight, eyeballing is sometimes good enough but for really large roofs some measuring tools might be needed. 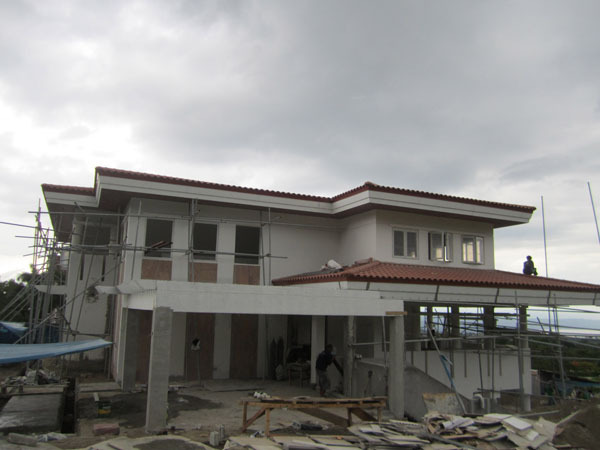 The roof height aside from whats specified on plan must also conform with the city and village design requirements. The details to be checked may include the fasteners for the roof gutters, these should be intermittently spaced for proper support. All roof ridges and valley gutters should be installed to prevent leaks along the joints and seams. Any material or unit sticking out should be fastened by tekscrew or blind rivet to prevent pieces flying off during high winds and rains. Fascias shoud be properly secured and sealed with the proper sealants to make sure everything is water tight. Usually its good practice to have a load of water poured by pressure washer or to await a good downpour to see if everything holds up. Warranties and guarantees should have been clarified with the general contractor and specialty contractor during the start of the process, but all of that is useless during the actual storm when a roof leaks, so its important to get everthing right the first time. 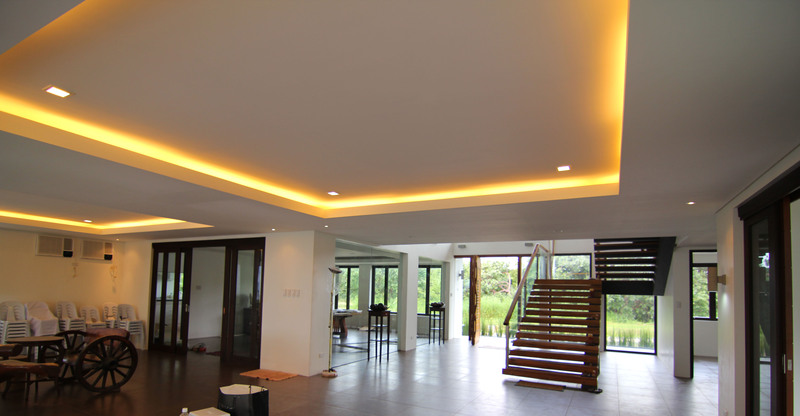 In a tropical country such as the Philippines the roof of a house contributes greatly against the intense heat of summer and the pouring rains of the rainy season, not to mention it crowns and gives character to the over-all look, hence the great importance given to its design and execution. Just remember when you’re up there, don’t look down. It started to rain and I had forgotten to wear my dependable site jeans. 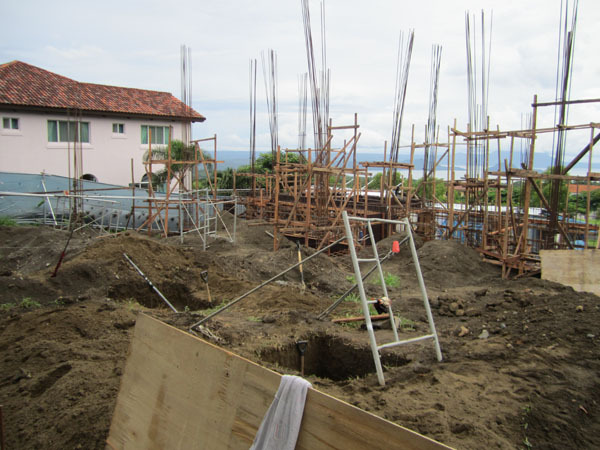 With hot weather it’s the perfect condition to start digging around at a site, but if you happen to find yourself still digging when the rains come in, you’ll be hard pressed in following your construction schedule. 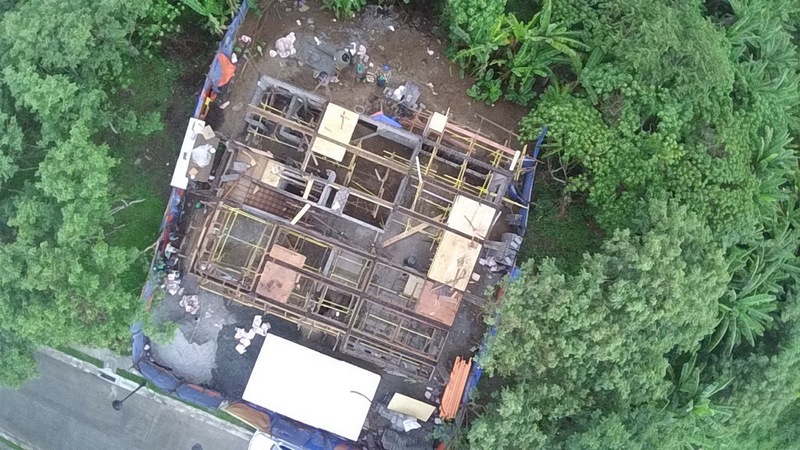 So at this point the columns are poured and the walls are going up, the preparations for the second floor slab should be underway. 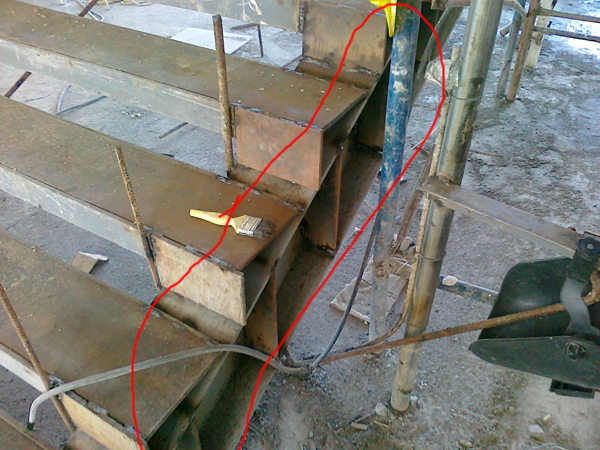 Preparations for the second floor requires the fabrication of the beam reinforcements. 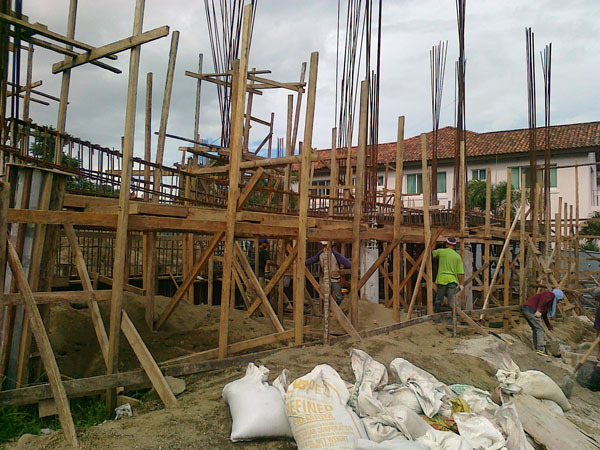 This is done by the bending of reinforcement bars to the specifications of the structural designer and architect, making the frames of beams that will eventually become the beams and slab. If there ever was a job for superman this would be it. 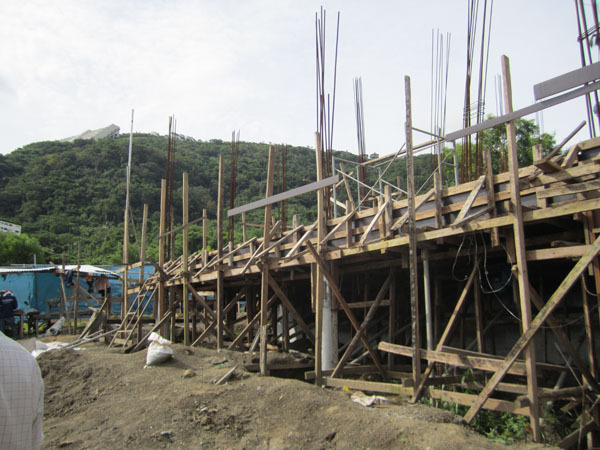 The forms are then constructed out of marine plywood or phenolic board in the shape of the slab and beams. These forms will serve as the containers for the mixture of cement, gravel and sand until they set and retain the shape intended for them. 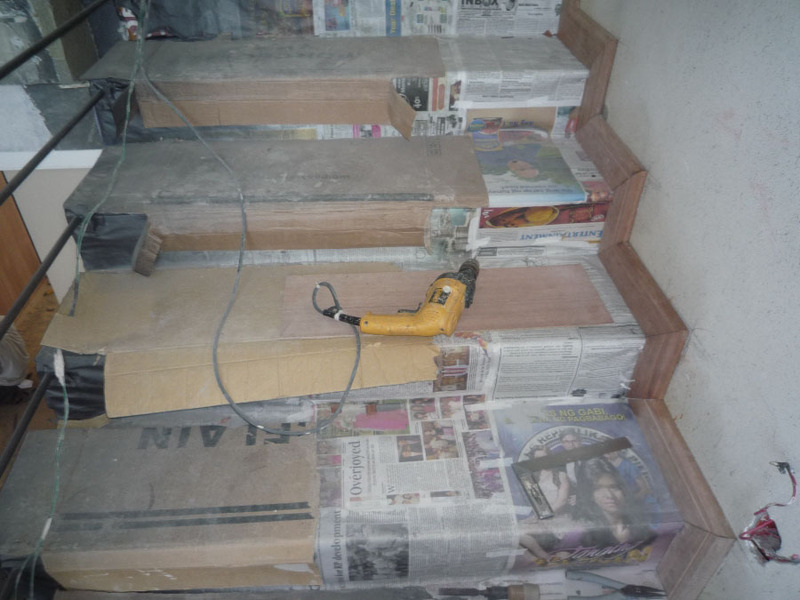 Upon curing, the forms are then removed. But before the concrete is poured a lot of preparation is done. 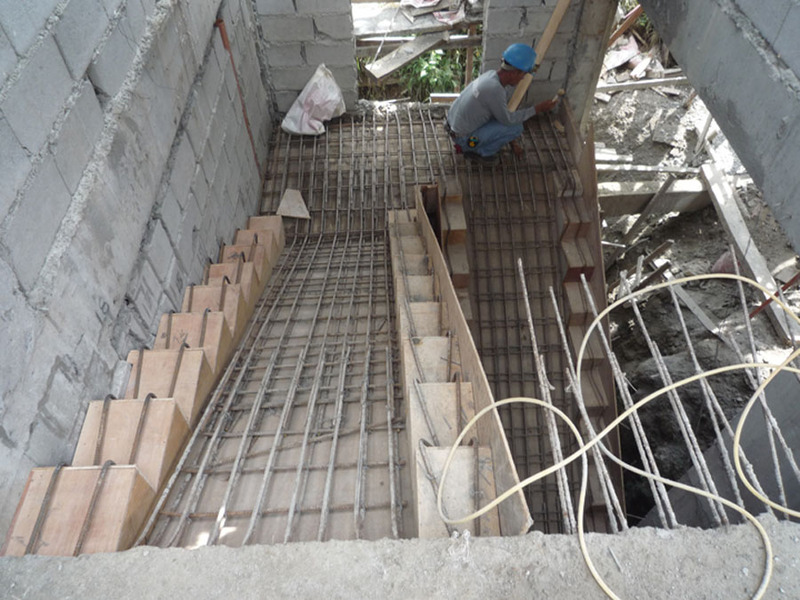 We mentioned the reinforcement bars earlier, the designers have a particular number of bars and particular size recommended for each beam which will need to be installed in a condition that will allow gravel to fit between them. 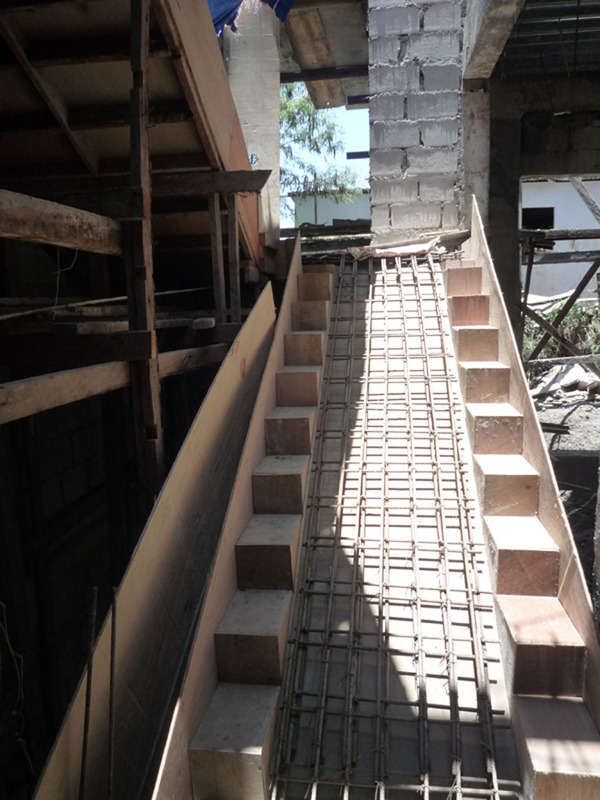 The provisions for conduits, which are pipes where the electrical wires run in will have to be put in specially if they need to go through any concrete member. 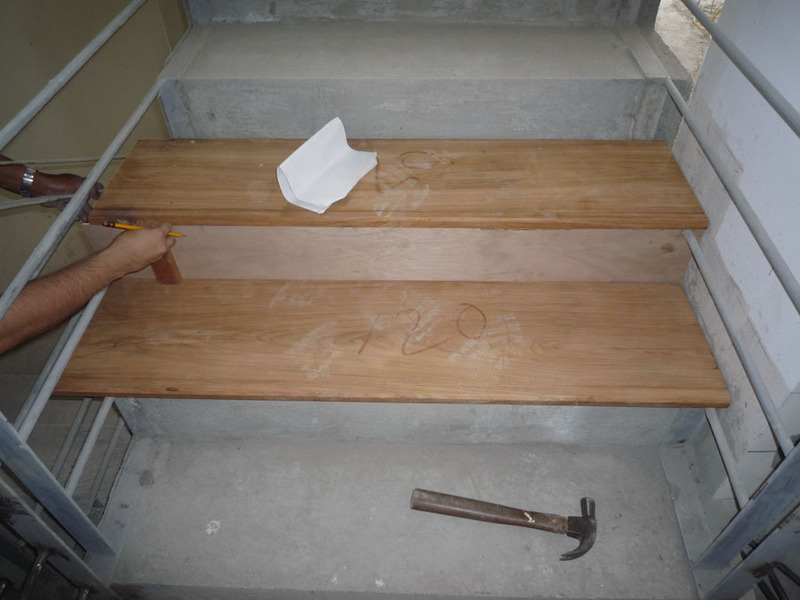 The same thing goes for water pipes, mechanical ventilation ducts and provisions like nailers for stair planks. 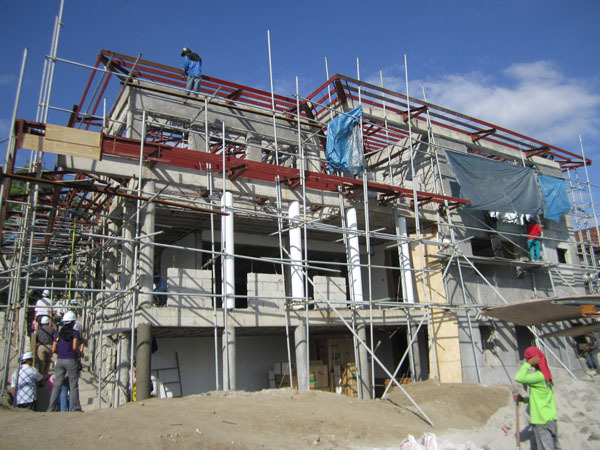 In a two storey house the pouring of the second floor is a major achievement and gives momentum in the race to reach the roof. 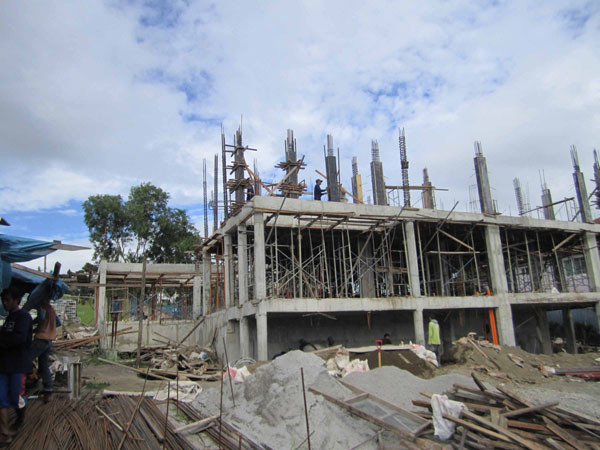 In multi-storey buildings after the pouring of the first suspended floor, the whole process of rebar fabrication, form construction and concrete pouring goes on until the last level is reached in what’s known as a topping off. 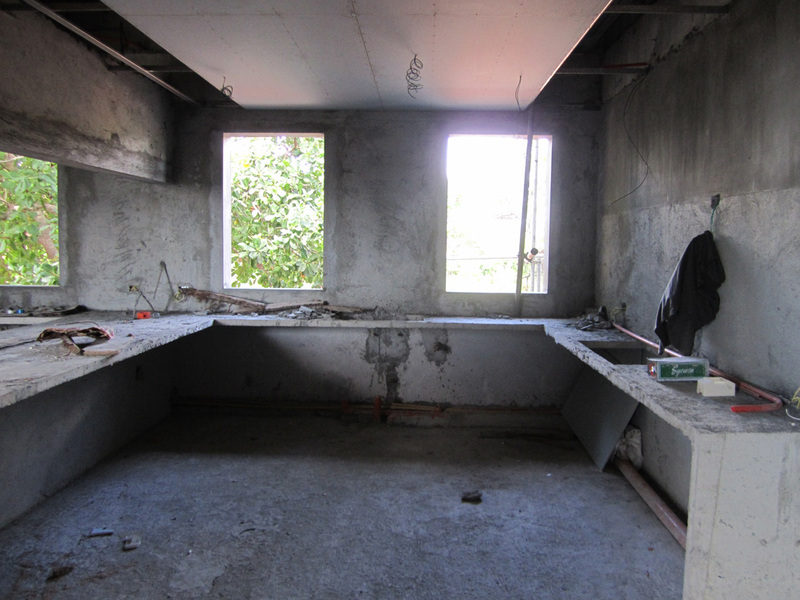 Part of the Architect’s Services are the intermittent site visits to the construction site. 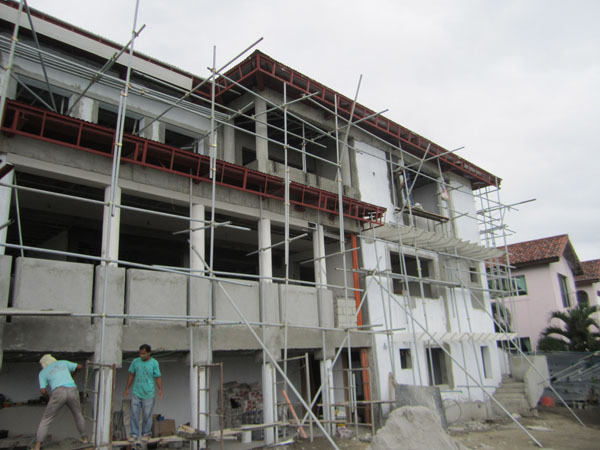 This is done so that the work done is kept as close to the plans as possible and to help the contractor and client realize the project. The kitchen in the house is very important. It is where food is stored and prepared as well as all the implements necessary kept, these items do not just have a function but emotional value to the owners of the residence. 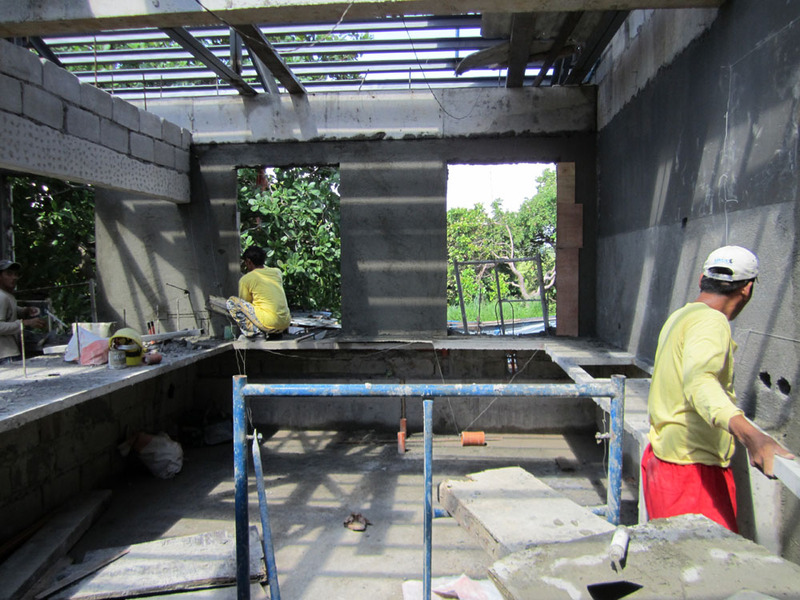 Which makes a kitchen, atleast in a home, more than a room with tools and food materials. In my experience the kitchen will speak of a lot more than the food that’s prepared and consumed. For the architect of a house the considerations of a kitchen are numerous. We plan that the kitchen is properly located, usually utility access from the garage or utility areas are made together with the kitchen’s access from the interior spaces. 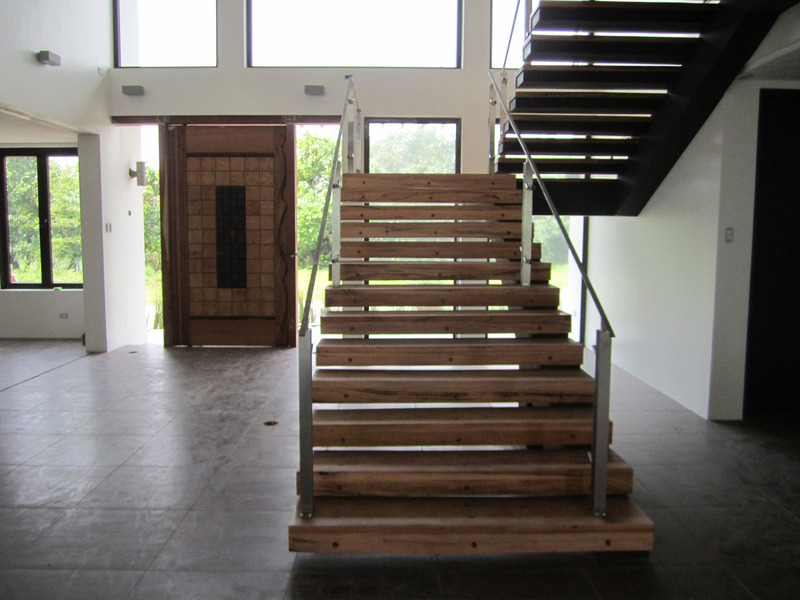 This access can be closed, done with a swinging door or covering wall, or open exposing an open kitchen that is meant to be viewed. 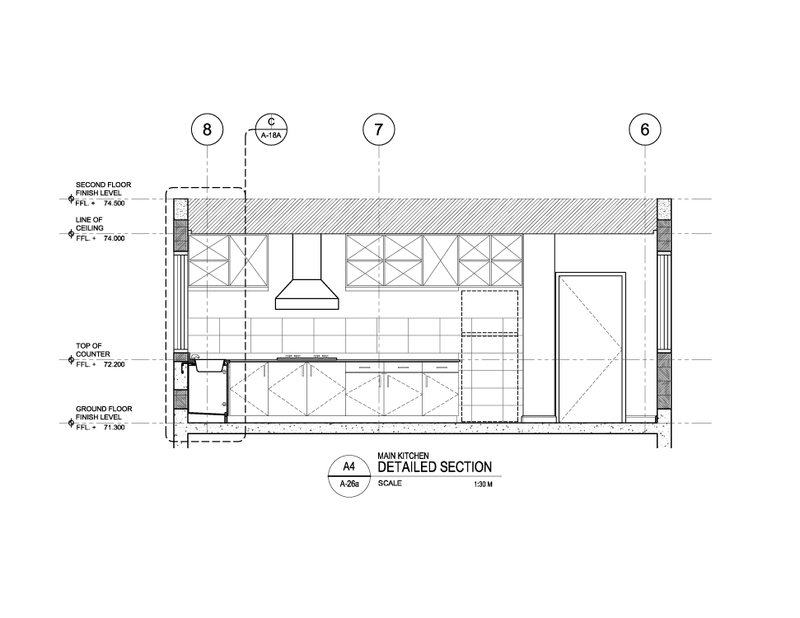 Its scale and area should relate well to the dining area served, and to the whole of plan, depending on its use. Ofcourse the owner’s preferences are the primary concern. 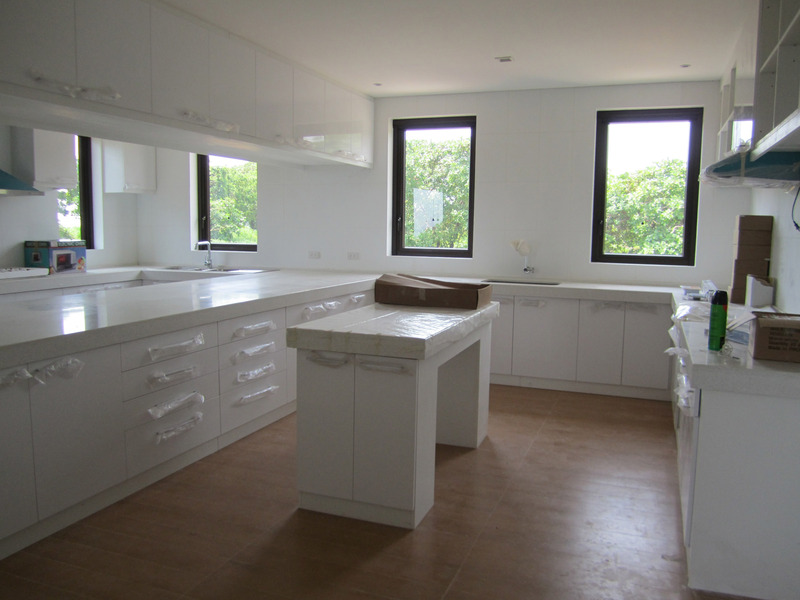 Sometimes an interior designer or a kitchen specialist is also employed as the kitchen interior will house cabinets, partitions & spaces for not just food, but pottery, china, tools, cookery & equipment. 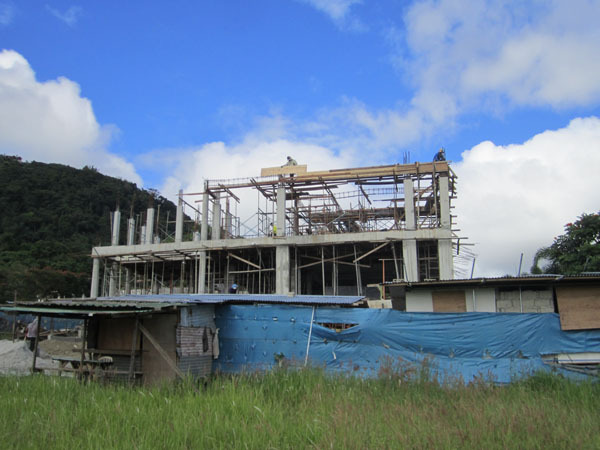 These are coordinated with the architect so that all stub outs and provisions are available and their locations coordinated well in advance so as to prevent unnecessary delay and interruptions during construction. 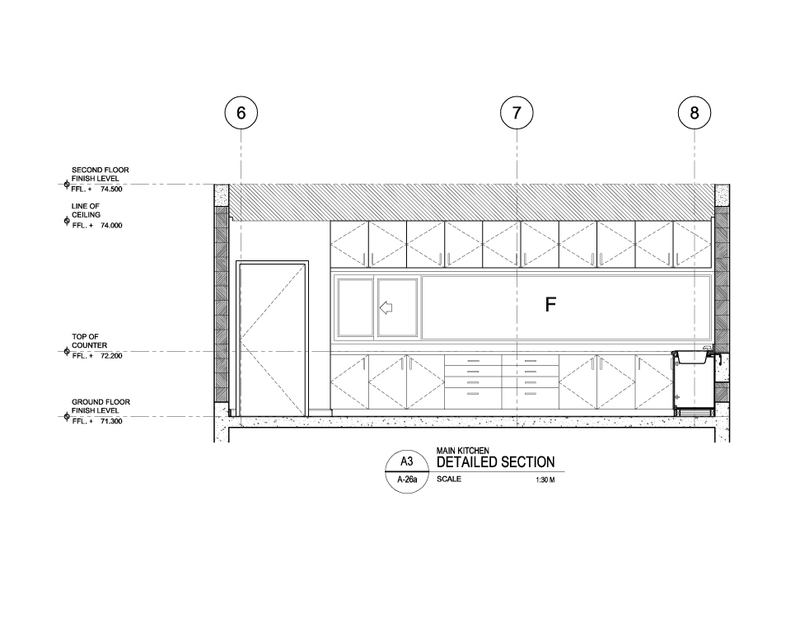 Structural provisions for support of cabinets, counters, and appliances that are designed, detailed and coordinated with the wishes of the client and the contractor. Plumbing provisions for cold water, hot water, drainage and waste disposal must be set up so that they are well hidden and do not take up any more space than required. 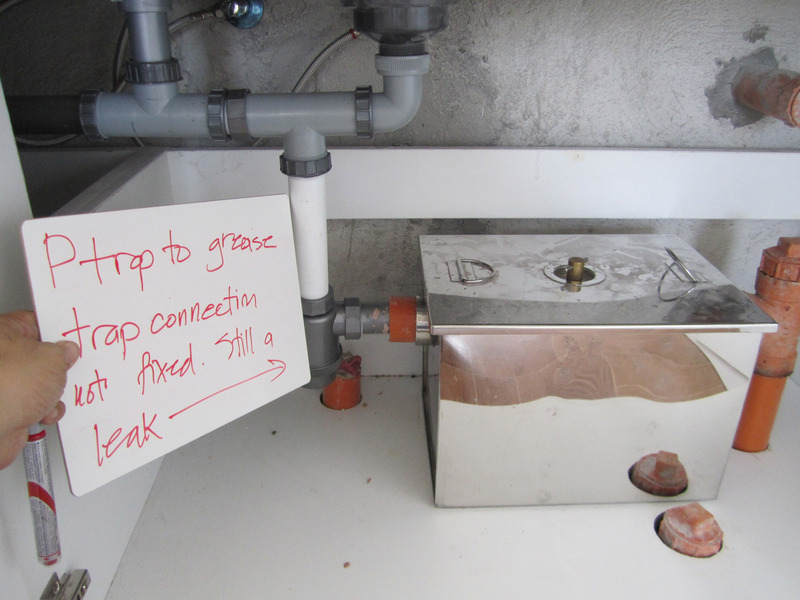 Since leaks are always a concern in the life of a building the provisions must all take the servicing of these plumbing fixtures into consideration. 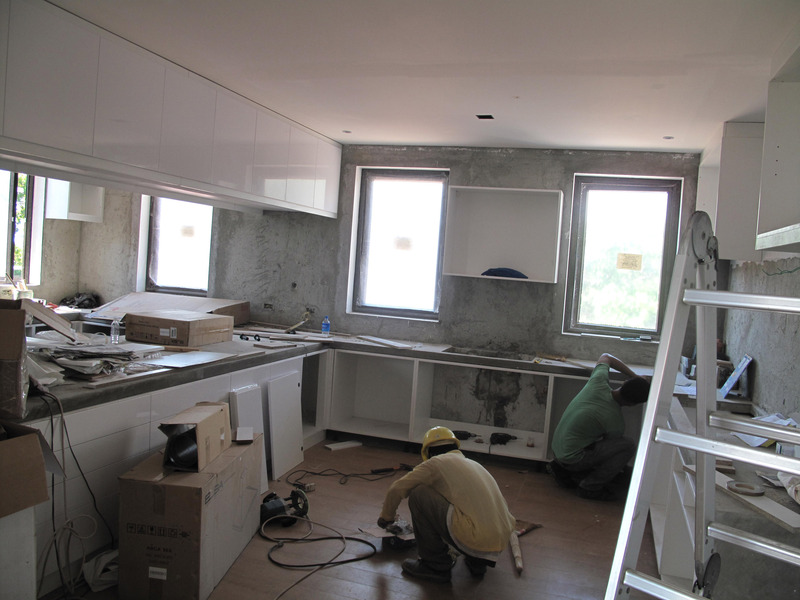 A kitchen will require a number of mechanical units to function properly, provisions for gas for stoves, air intake for ventilation and comfort of the users, range and cook hoods to exhaust smoke from the work area, and perhaps airconditioning for improved comfort as the client requires. A modern kitchen will require appliances that require electricity and grounding. Microwave ovens, food processors, induction cook tops have joined the electric range, refrigerator, freezer, deep fryer, water heater, blender in the every growing list of power consuming machines that need be sized and their power provisions properly accommodated, so that the place will not require extensions or seem like a den of serpent power chords when fully operational. Sometimes with the advent of the internet, provisions for ubiquitous wifi connected appliances will also be required. All of these must come together in one design that will function and be aesthetically pleasing. 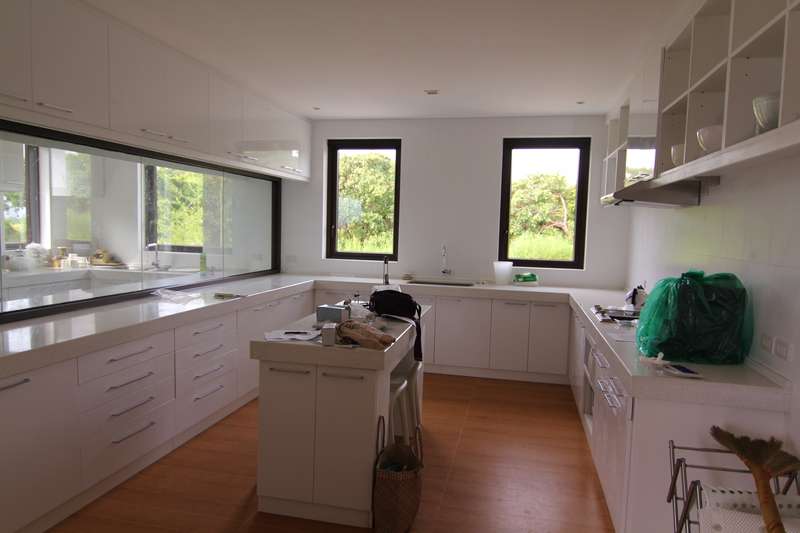 The following kitchen was designed for a client’s rest house, with specific needs. 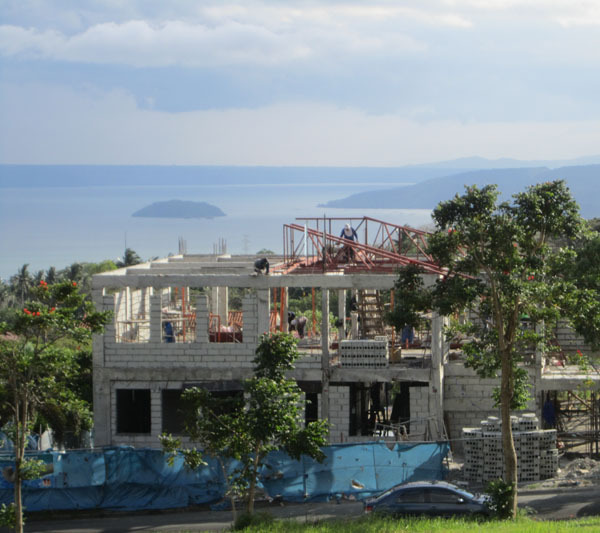 It was fortunate that they had a clear idea as to what the kitchen needed to have, the activities within, the support areas and equipment, and even the over all look was tested and revisited multiple times as needed to prepare for the construction. 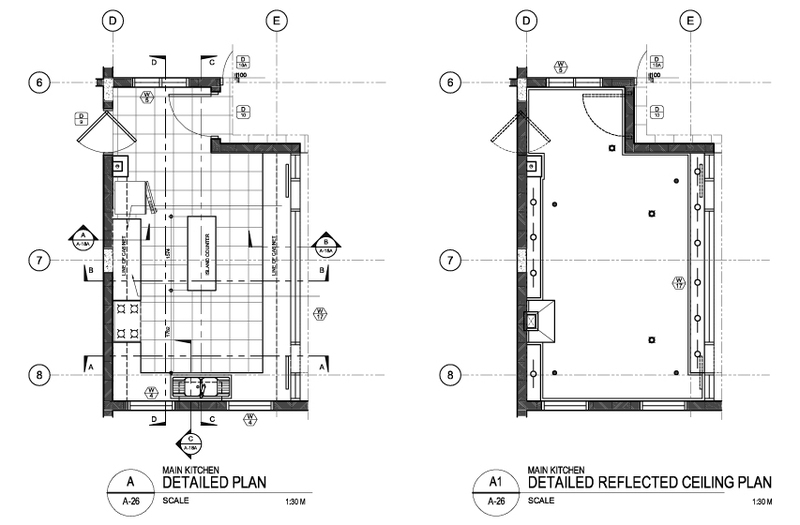 Aside from the main floor plans, the architect or designers will take care to detail the kitchen reflecting as many aspects of the design as possible. 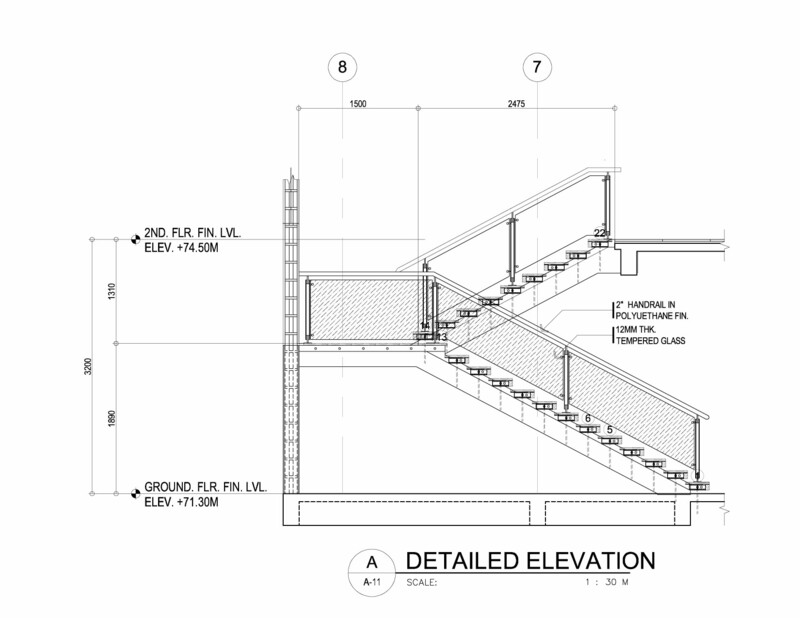 When the drawings are done, subcontractors and suppliers are tapped to provide feed back if the design is feasible as well as to provide their own input regarding the available materials and cost. 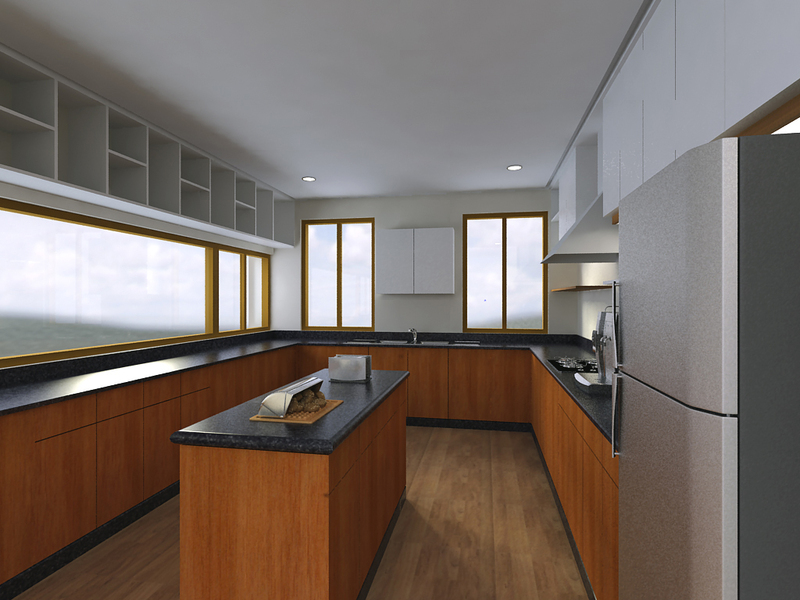 Upon setting upon the counter and the cabinetry we revised the over all look of the kitchen from the original design intent and a final design of nearly all white was chosen. Concrete counters have pros and cons. But the qualities of strength and durability were foremost in the client’s mind, we had to compensate for the shallower drawers by making more of them. 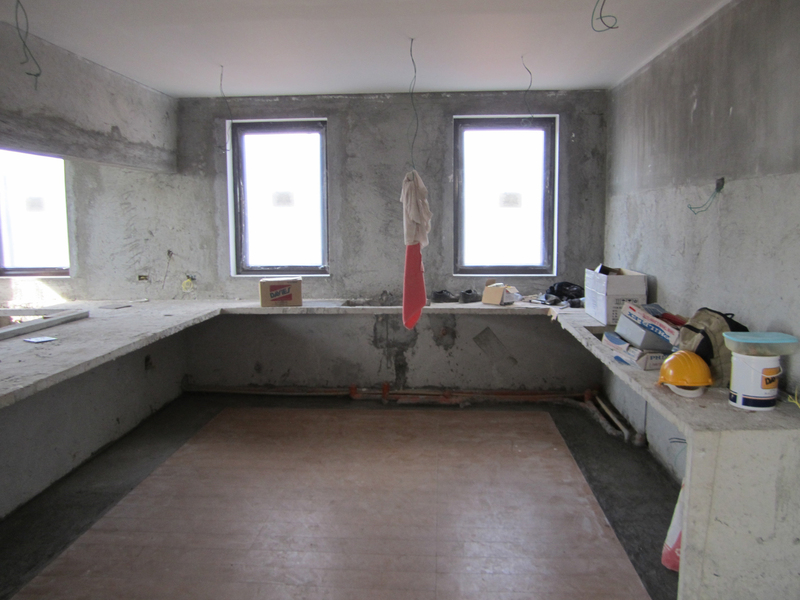 And we had to coordinate with the cabinet subcontractor as many prefabricated cabinet systems did not allow for concrete countertops. 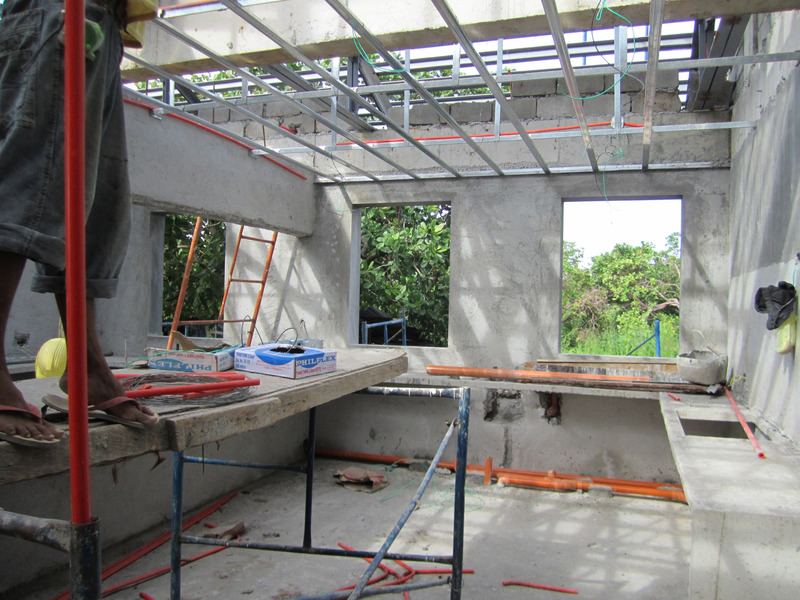 Installation of wiring, ducting and plumbing stub outs and provisions. Many of the engineering systems earlier mentioned were reviewed one by one on site to make sure they were all provided in the spaces and in the proper orientations. Cabinet installation and ongoing plumbing layout. The installation of the cabinets and finishing are done with care and considerations for all the stub outs prepared, whenever possible we go over the items to be installed, and the quality of the work, to prevent damage to the expensive materials and make sure all issues that crop out regarding installation of appliances are addressed. 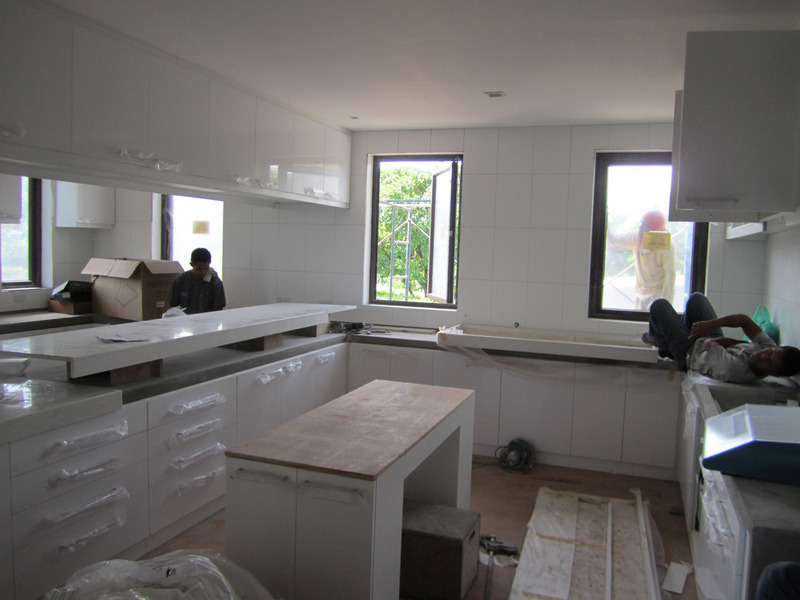 The fit of the counter tops, the fittings for plumbing are some of the items the construction team of the client review, as the fit out of the kitchen moves forward. 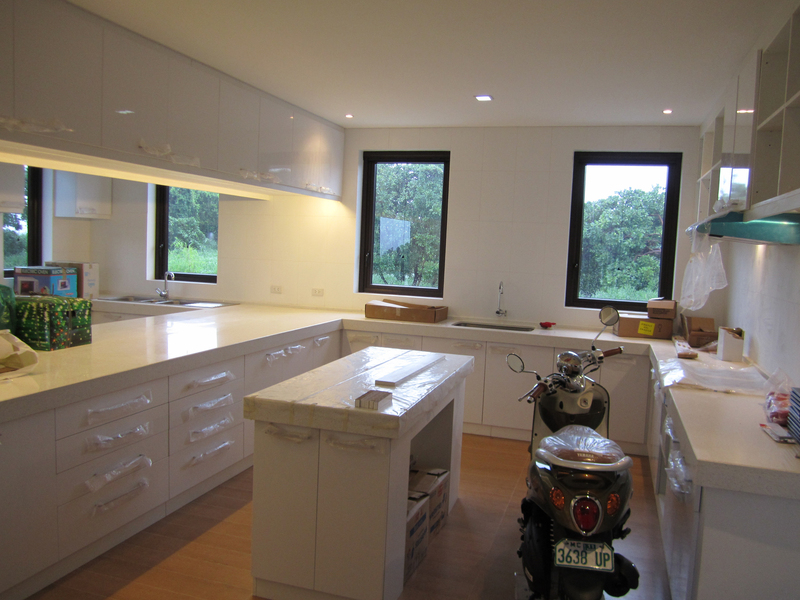 Handles and hardwares are installed on cabinets, and appliances are installed in their spaces. 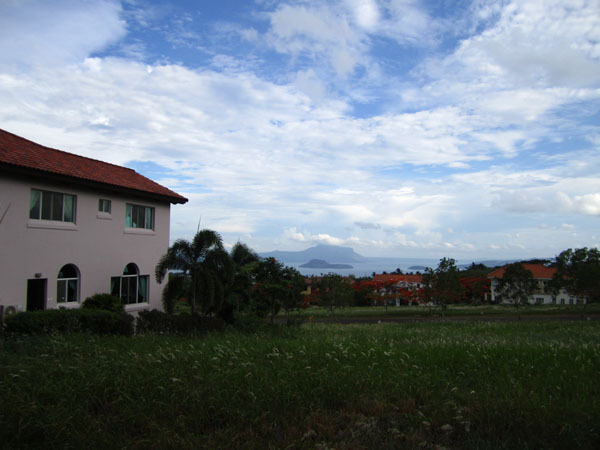 Lights and appliances are tested, cabinets and drawers are all opened and closed to insure work is properly done. Once everything is in place, all the items are tested. The lights are opened and closed, the appliances are turned on and checked for any leaks or problems, all the drawers and cabinets are opened to check for quality and cleanliness. Last minute requests like installation of towel racks, pot holders hooks are addressed. The kitchen begins its life. When all is ready, the client then moves in and activates the kitchen which by now provides the throbbing heart of the home, where food is prepared and life is savored. 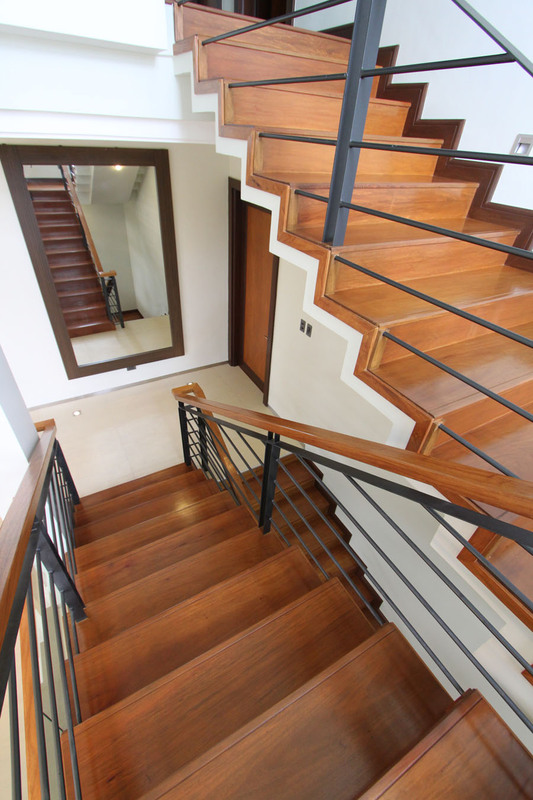 The staircase for this house built for young professionals, was to be modern, fresh and exciting, but simple, elegant and sturdy for sometime. 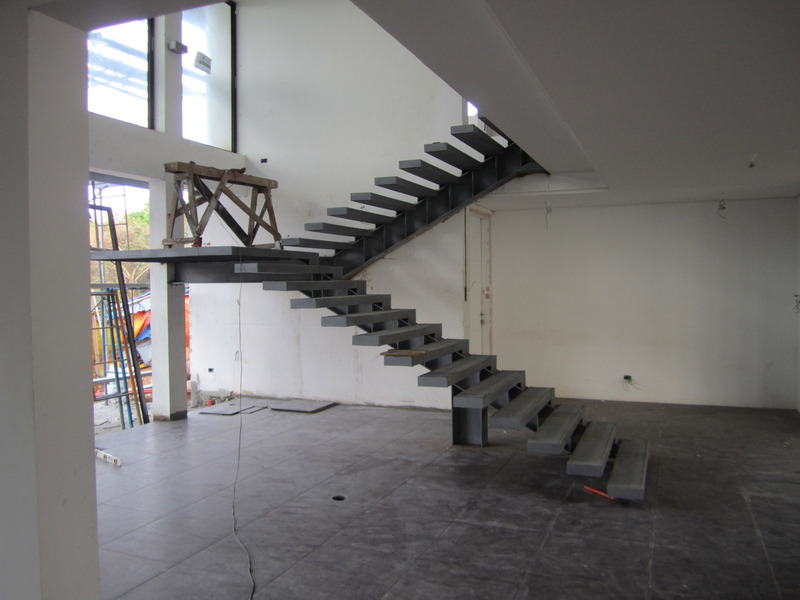 With the help of our interior designer and structural engineer we were able to have a design that answered all the requirements of the program. 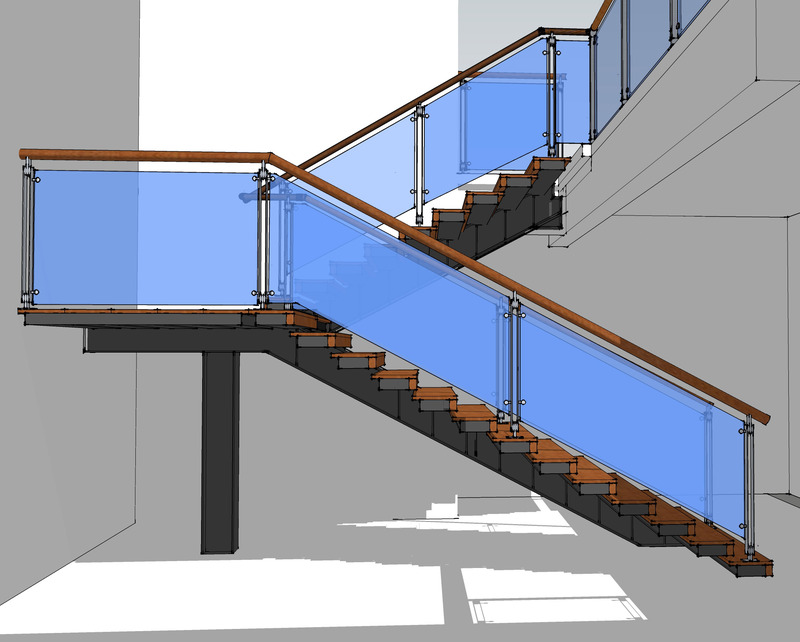 Our design solution was inspired from a steel frame business type access stair, which we decided would be used as a overlay of the reinforced concrete stair that was planned for the house. 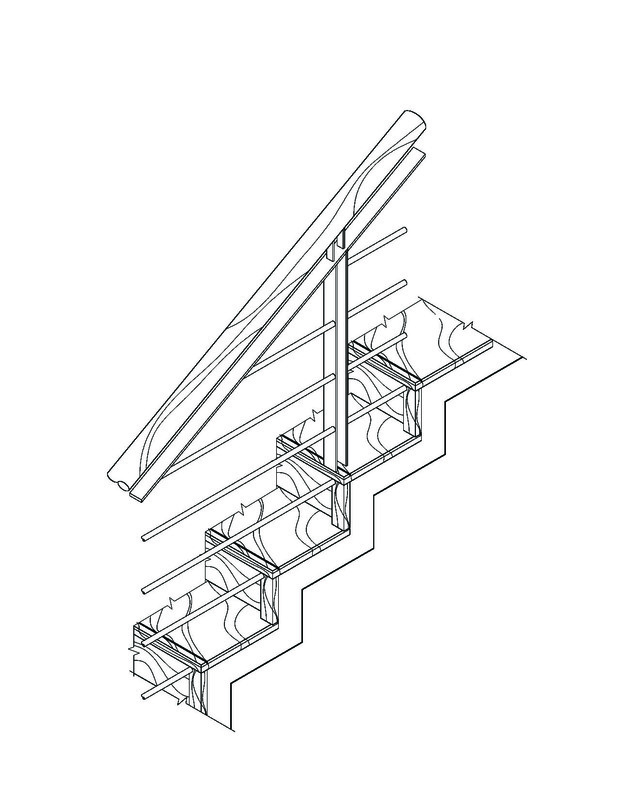 Making the statement was the zigzag form that the tread and risers would take, further made interesting by a horizontal railing design that would be completed by a wood and metal hand rail. 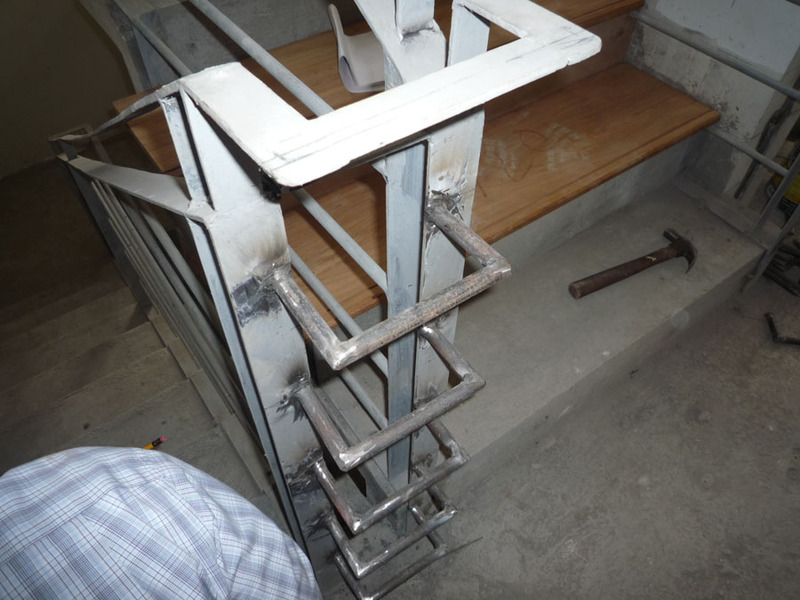 Our initial difficulty was that the structural design was in the conventional manner, that was a solid with the risers and treads only seen formed from above, and a plane incline below, to follow the zigzag form literally would make the lines too thick as it would not support the load. We wanted as thin a line as possible for the zigzag. 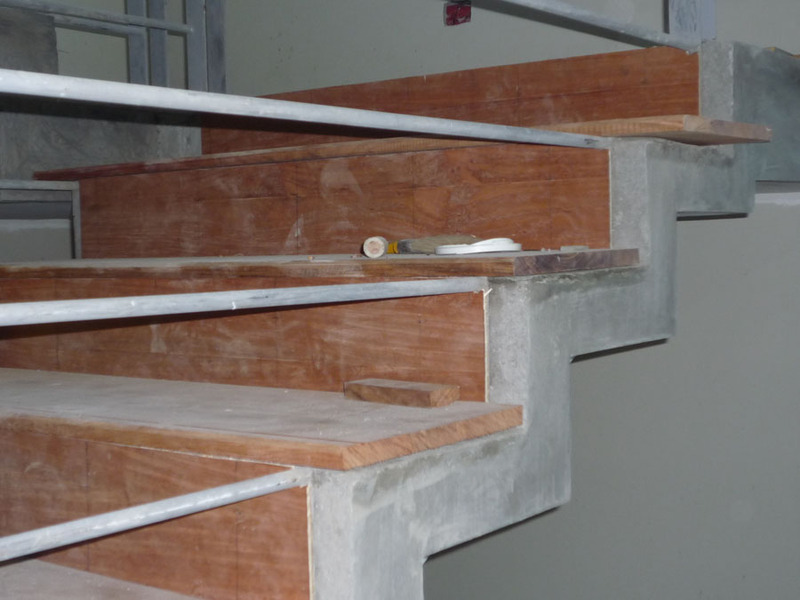 The solution was to pull back the concrete slab from the edges, just enough to create the profile we wanted but without making it too weak that it would crack, or too thin that it could not carry its weight and as well as the live loads. 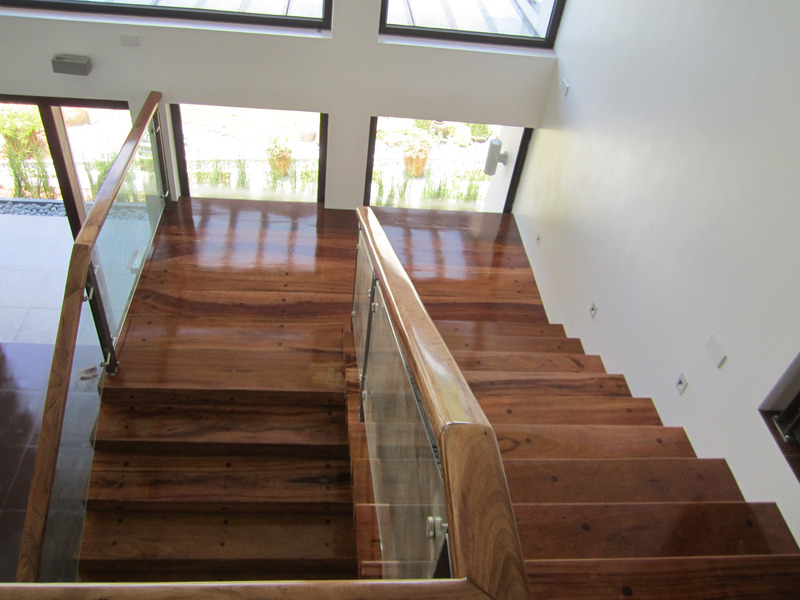 The next challenge was regarding the look from the top and the budget. A zigzag pattern should have a continuous finish on the tread and the riser, setting planks for the treads would mean planks on the riser which after confirming with the client, would be beyond what the budget would allow, so we made use of plywood on the risers and found a way to use casing to hide the thickness of the planks so that from the side it would seem that the treads and the risers had the same thickness of material. 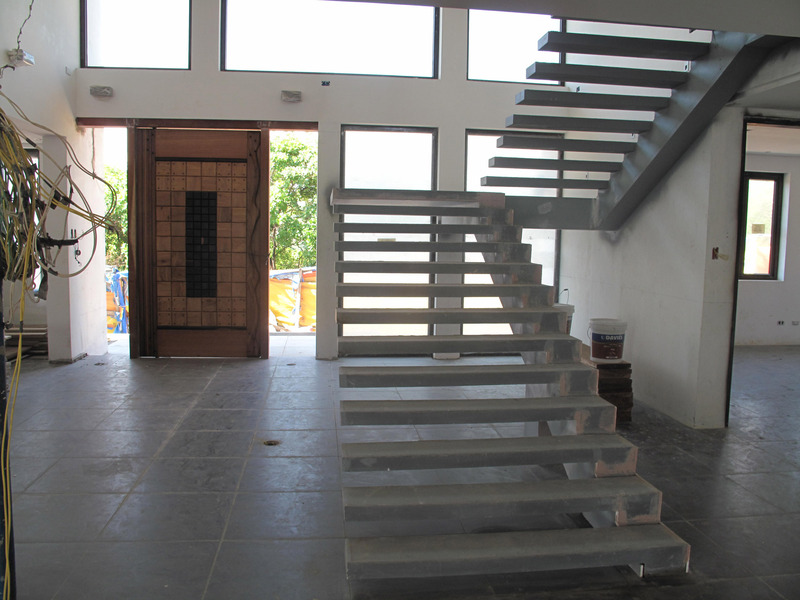 The clients approved of the scheme among the number presented and the interior designer gave particular instructions regarding the finish and the look. We went into its construction shortly after. 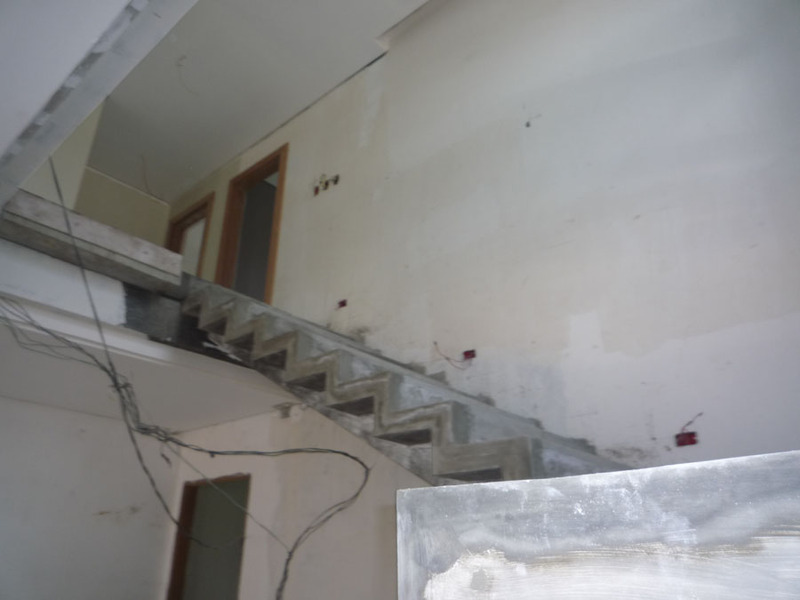 Forms for the concrete stairs are done as exterior molds of the form, and it was interesting to see the inclined mass flanked by 2 stair like molds. 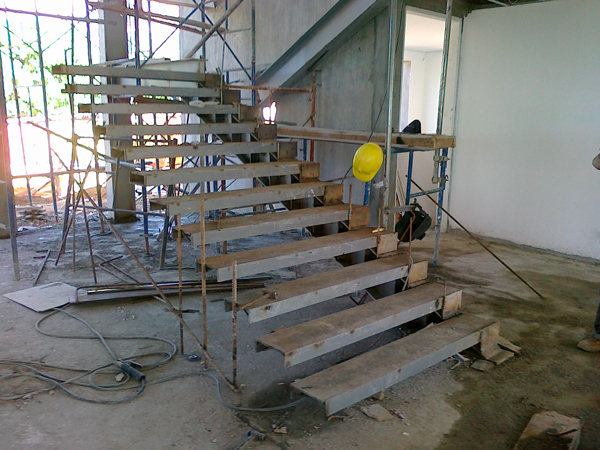 After the concrete was poured, and the forms removed, the initial stair form was realized. 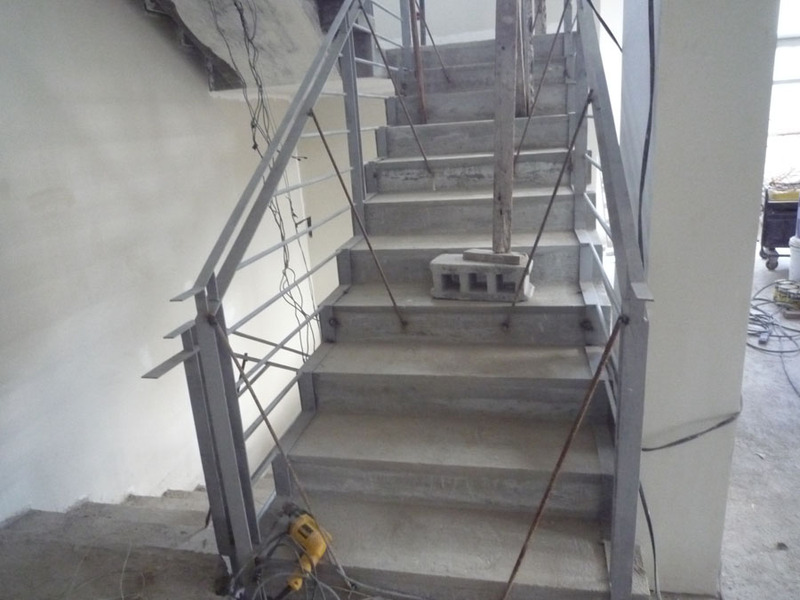 For the railing to be successful, the stair treads were measured as basis for fabrication, the design composed of round bars & flat bars were then painted in grey epoxy paint for protection and installed to the concrete stairs. 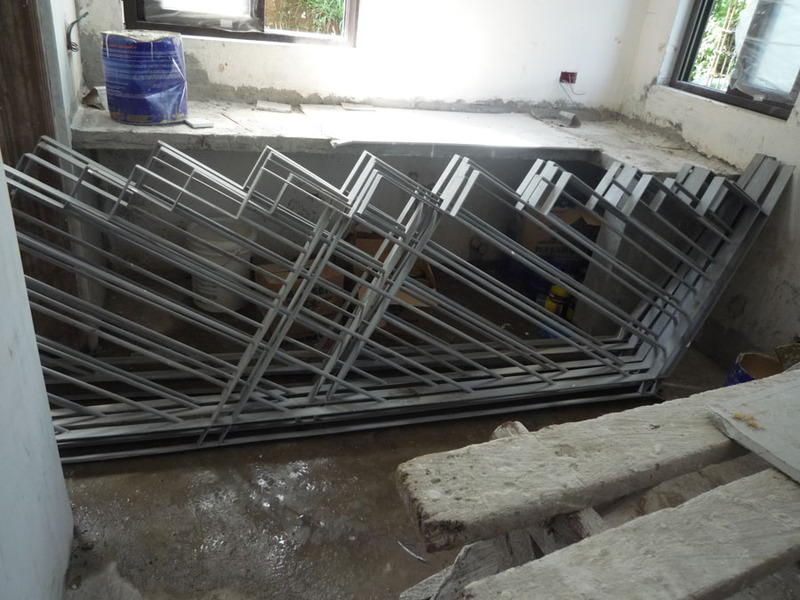 Stair railings delivered to the site. 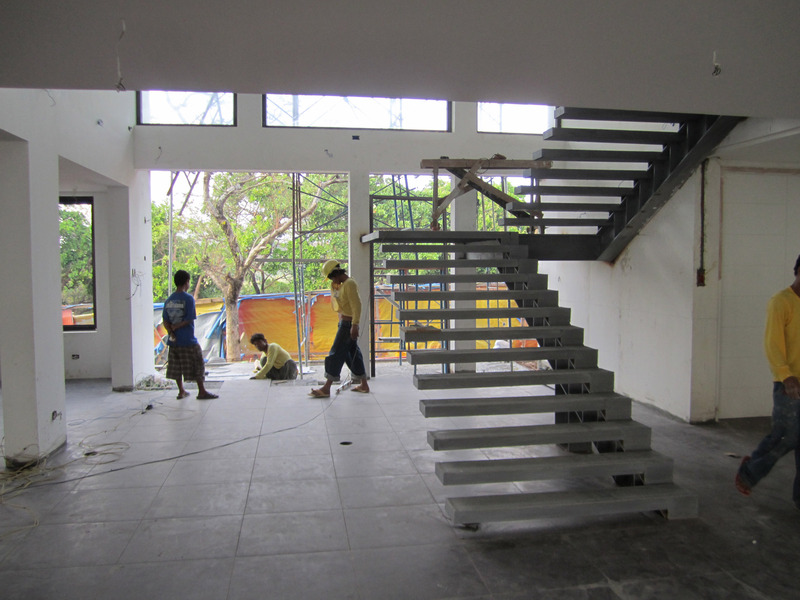 Installation of the railing to the concrete stairs. 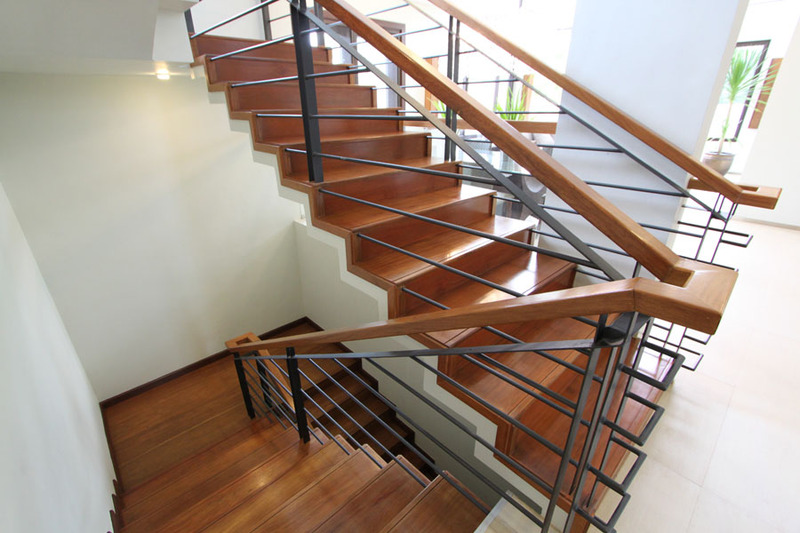 Wood planks, plywood cladding and casing were installed in such a way as to make the wood seem consistent with the zigzag form, as well as to hide the flat bar connection between the stair and the railing so that the design would seem to be projections of the zigzag design. Wood plywood and planks installed. The minor details would prove to contain the delightful characteristics of the construct. 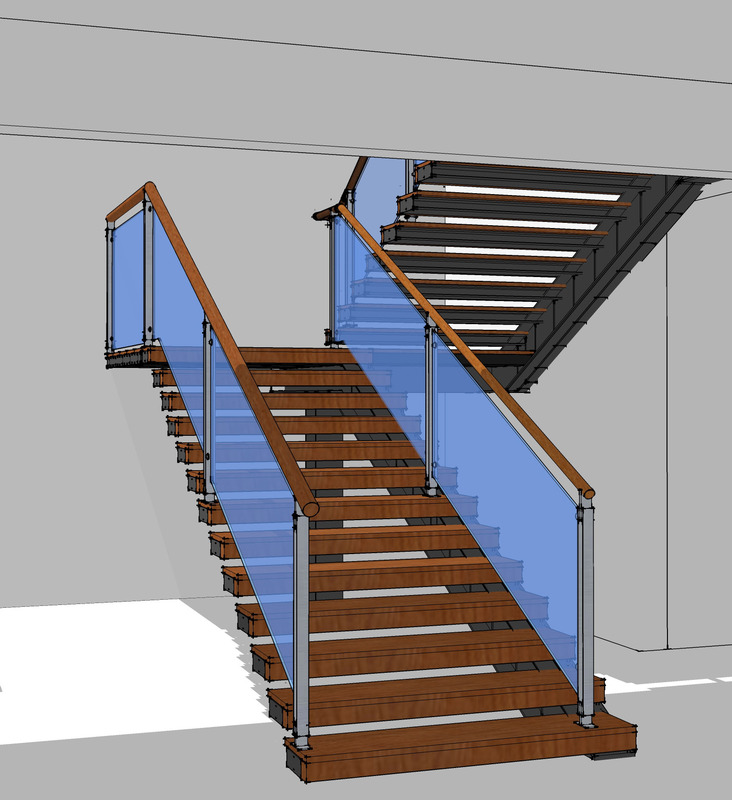 From the landing termination, hand rails and the zigzag baseboards, these elements would help support the over all concept. 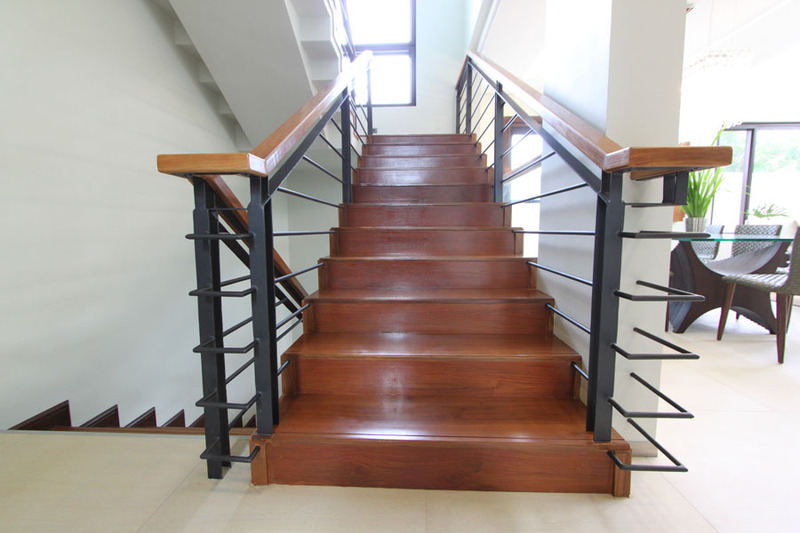 Detail of railing at the landing. Baseboard trim installed where the stairs meet the wall. 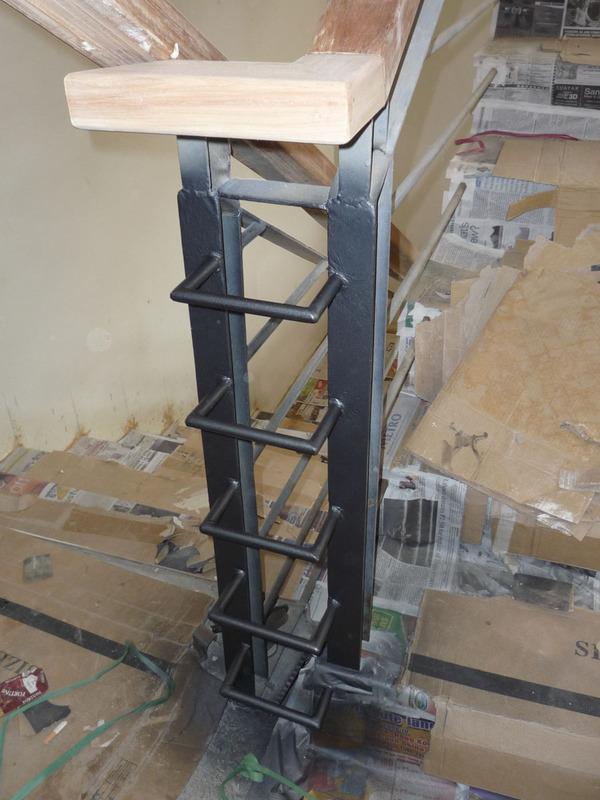 Hand rails are installed on the flat bar supports. 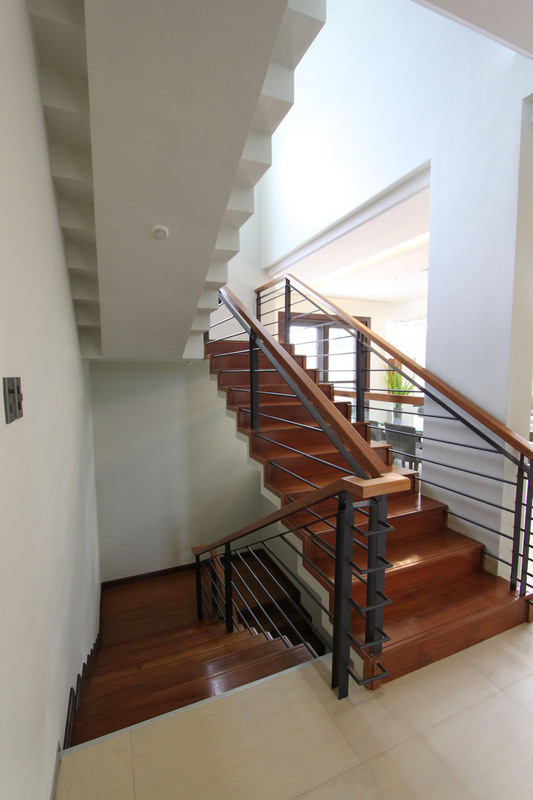 When all the components were installed and ready to accept final finish, we had the client and the interior designer approve the color, and texture of the wood, as well as the metal railing. All of these choices were done to complement the over-all color scheme of the house. 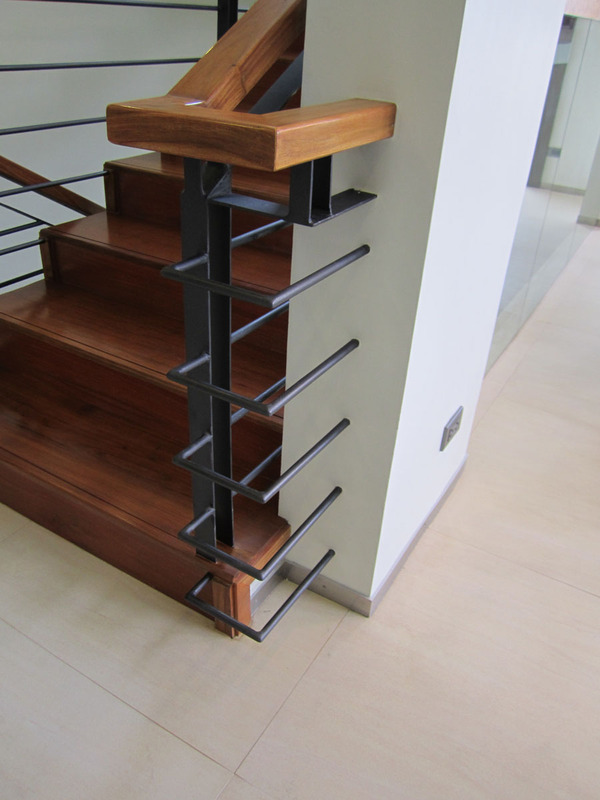 Dark grey color for the metal railing. 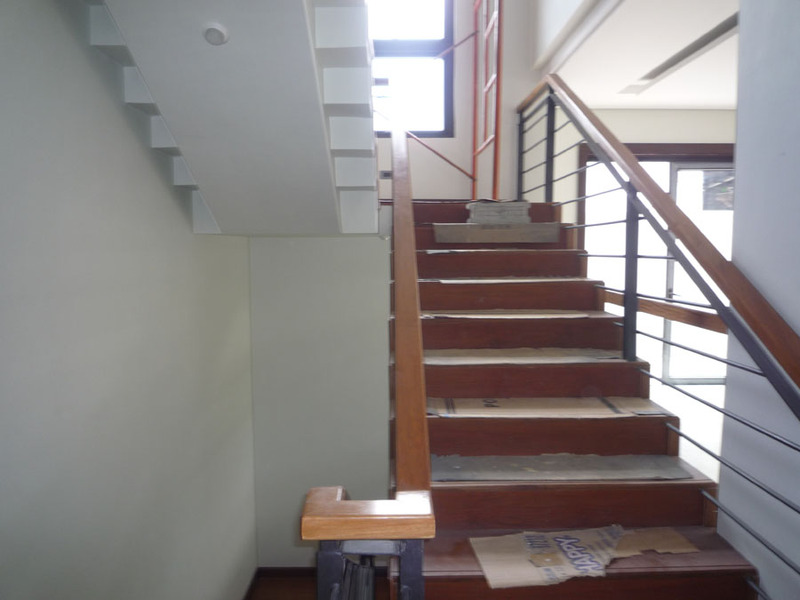 Wood planks and hand rail were done in a matte finish as per the interior designer’s instruction. In the end it came out better than expected and would be a centerpiece for the house interior. 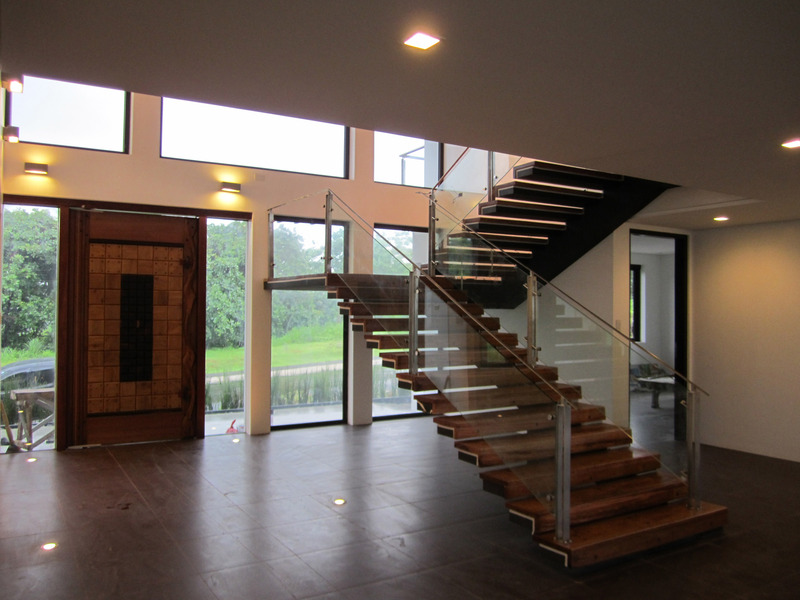 View from the ground floor landing. 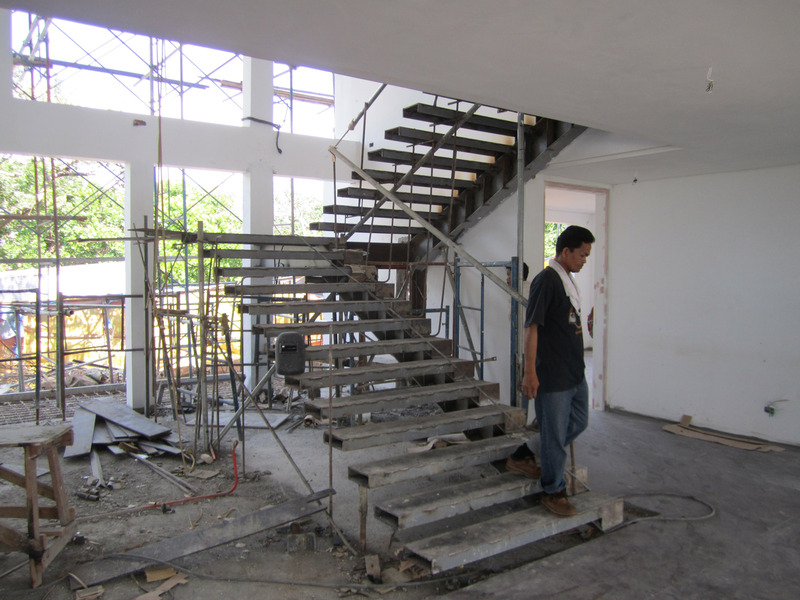 View of the stair from the midway landing. 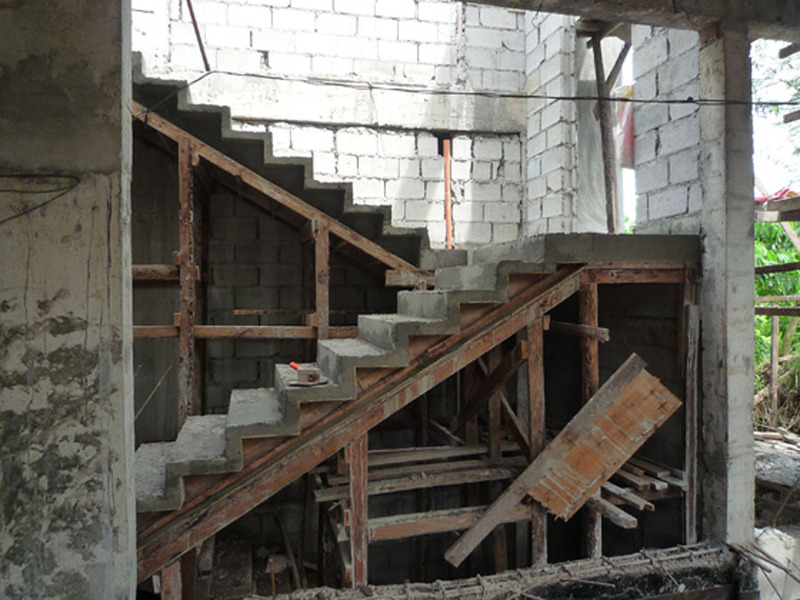 View of the ground floor stair and the lower level landing. 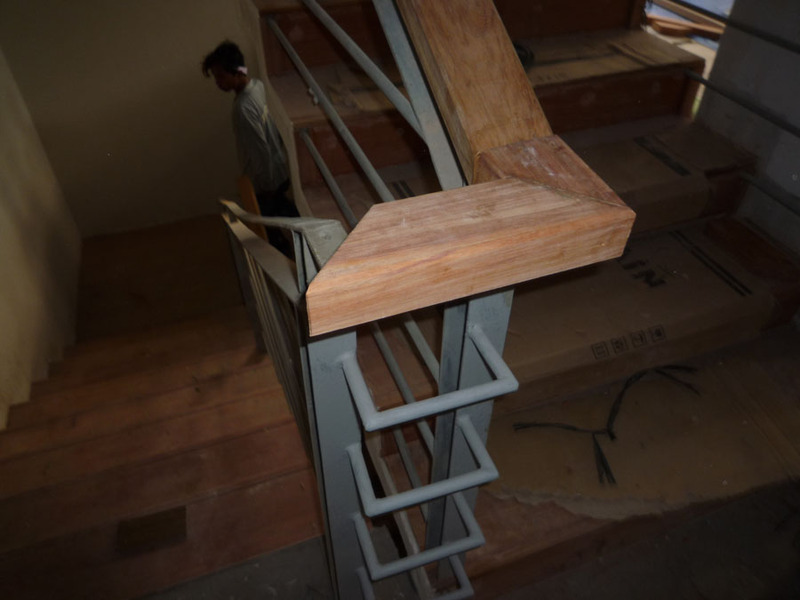 View of the stair from a low vantage showing the railing termination. Detail of metal railing with termination at a column post.